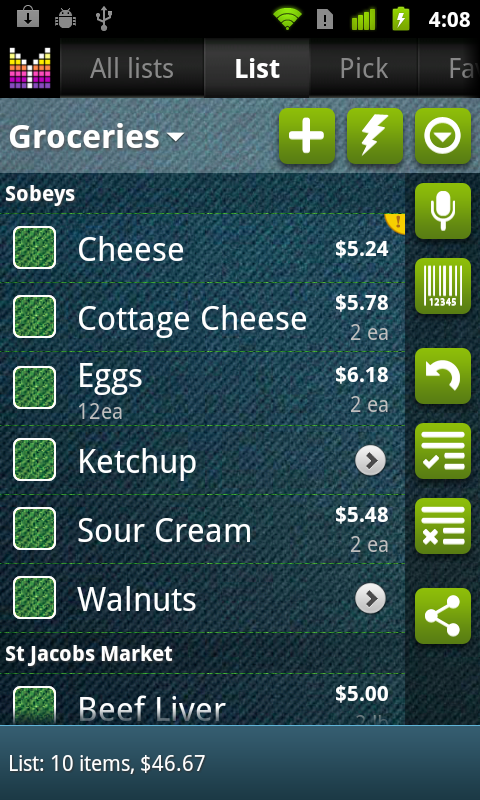 In an earlier iteration of your app, I was able to choose from a list of stores. Where has this option gone? Jacob, the list of stores is available under All lists tab. Make sure that you select “All lists” in the selector on the top. I want to be able to choose items from a master list and have them automatically go to a store specific shopping list based on where I previously purchased the item. Even better would be if it would add it to a store specific list based on best previous price. I sort of want the app to learn my shopping pattern and populate my individual store shopping lists based on best previous price. Will Mighty Grocery do this? Hi Grant, thank you for your suggestion. We may consider implementing this feature going forward. Alex, I may just purchase your app based on the fact you replied to my question in a positive manner. I hope to see this feature in the future. Thanks! Grant, thank you for your feedback! Feel free to contact us again with any further questions or comments. I’d love to see this option too! Thx! Alex, I have been using MG for a year and a half now. It was the very first app that I purchased. I am still amazed at how robust the app is and each of the updates has improved the product without introducing bugs. It is rare that a developer takes the time to document, answer questions and test thoroughly before releasing. Great job! Thanks a lot, Cynthia. I really appreciate your feedback. I also think you should put the FAQ at the tale end, not the beginning of the list, for the above printouts. One cannot understand the context behind the FAQs or know which one(s) to read until one has had a chance to be familiar with the User Guide and find out what parts aren’t clear. On the same subject, not all user questions & replies appear to be included in the list. As I write this the section marked “Replies” says it has 28 entries, but there are only about a quarter of that many displayed. 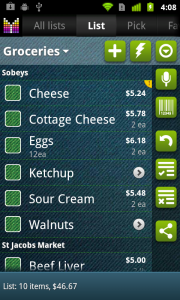 However, displaying the entire User Guide as one page and then scrolling down to the bottom stops after Manage Aisles. Units and Configure tabs aren’t included. Bottom line: I’d like the ENTIRE User Guide, including subtopics, Q&As, and possibly any external links (printed in-line) as one document that can be printed, with or without Q&As. Thanks for creating the User Guide, though. Creating user guides (and for that matter Reference Guides, which are an entirely different document) is hard work if you want to do it really well. I learned this from experience as I climbed up the marketing ladder to senior management. For that matter, Product Management, often underrated, is both vital and difficult to do professionally. Good work ! As you might have found, the entire User Guide is available as a single page, so you may want to print it out. As for user questions and replies, please note that people leave comments on different subjects all over the site, and questions may duplicate as well as comments can be feature requests, suggestions, etc. Therefore we put the most popular questions and responses in FAQ section. The FAQ section is on top of TOC just to let people know that such section exists. It is not supposed to be read through, just to be used as a reference. I just purchased the full version .. this being the only app I have ever paid for. How can I get all my info transferred from the Lite version to my new Full version? I have List selected as described in . All List displays to the left and to the right are Pick, Favorites, History, and More; Aisle does not appear. How can I get Aisle to also display? Stan, is this what you are looking for? Can you add items to catalog that is not in any list? Hi Brad, thank you for your question. Kindly note that currently all items under Pick list are available for any list. You may want to try list-specific favorites feature in order to make items available to a specific list only. Please let me know if yo have any further questions. 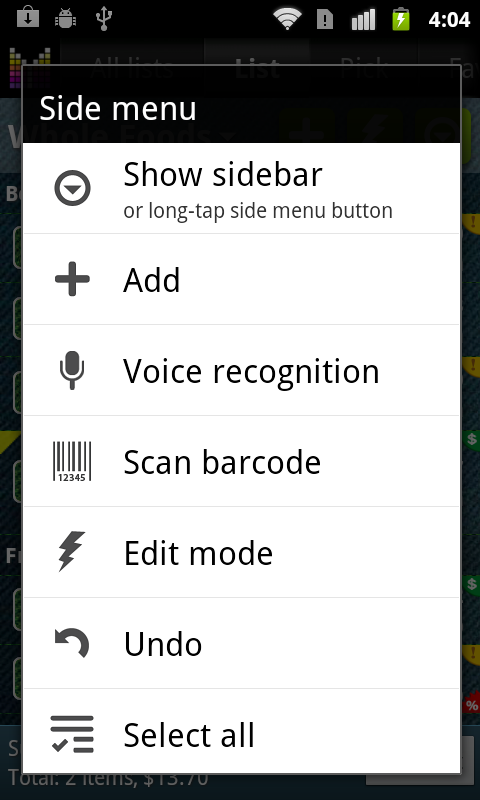 I have an HTC Evo Shift, and your program is not recognizing my numbers. When I use the pull out keyboard, your program doesn’t recognize the numbers. It puts in random numbers. Hi Sheri, thank you for contacting us. Unfortunately, I don’t have specific recommendation for your device. However you may want to try pressing FN key once or twice before entering digits. Hopefully this helps. Hi. . I do like the app havng tried Light version and bought ful nul full version. But I have a number of problems. The touch screen on they S2 is very sensitive and is easy to enter items by mistake. A simple confirmatiom screen would help. Also how do you remove an item for list? I have tried the available commands only delete seems yo do it but that takes it out of the dbase. Only solution appears to checkout items? The same applies to quantites. if I decide on a one off basis to buy extra quantities. I don’t want this to change the normal quntities. > The touch screen on they S2 is very sensitive and is easy to enter items by mistake. A simple confirmatiom screen would help. 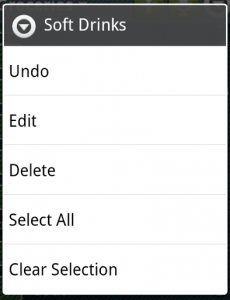 In case you do something wrong, you can easily Undo last action in Menu –> Undo. This command is available on every app screen and can Undo any action: Add, Edit, Delete, etc. (except for backups). > Also how do you remove an item for list? I have tried the available commands only delete seems yo do it but that takes it out of the dbase. Only solution appears to checkout items? 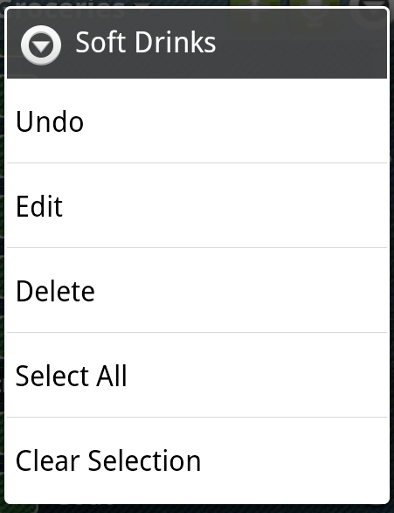 If you’d like to remove item from a shopping list, you just long-tap it and choose delete. If you’d like your item to remain in product catalog, please use the Configure pick list feature. > The same applies to quantites. if I decide on a one off basis to buy extra quantities. I don’t want this to change the normal quntities. If you don’t want item changes to propagate to Favorites or Pick list, you need to turn off Link button. Please see Linked and Isolated changes in User’s Guide for more details.